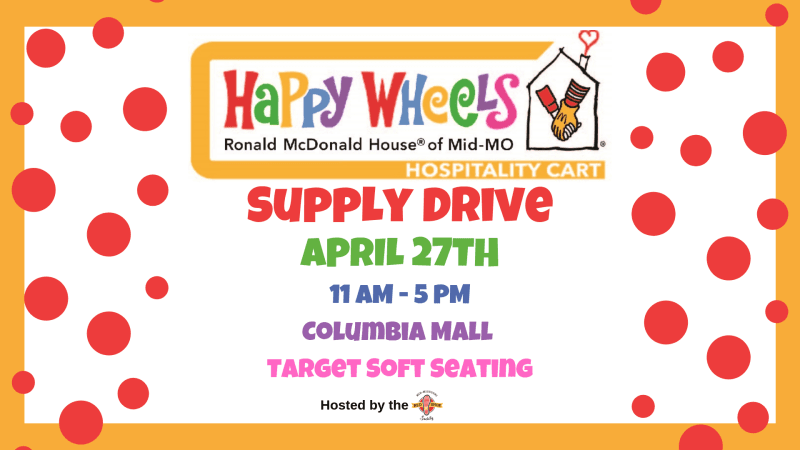 The Ronald McDonald House Charities of Mid-Missouri is in need of supplies and donations to stock their Happy Wheels Hospitality Cart. The Hospitality Cart is designed to serve families who wait hours at the hospital without leaving the waiting room or their child’s bedside. The cart offers basic necessity items, snacks, and fun activities that bring smiles to parents and kids when they need it most. The Red Shoe Society will be hosting a Supply Drive on April 27th from 11am - 5pm in the Target soft seating area. They will be handing out a wish list of items needed for the Happy Wheels Cart. Visitors can purchase or bring in items from the wish list to donate. All supply donations go directly to the Ronald McDonald House Charities of Mid-Missouri.